Plated reflective steel cathes the light. Turns easily and gently on ball bearings. It is a well known fact that when a farmer walks into a field carrying a gun the birds disappear! Robust tread-in stake and heavy duty anchor plates for stability. 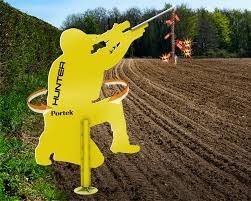 Seen The Hunter Bird Scarer Cheaper? We will match any online price for the same product.